Yesterday, I was flipping through my new Family Fun magazine, and I had to smile when I got to this page. This is a human-scale birdhouse that my kids and I know very well! 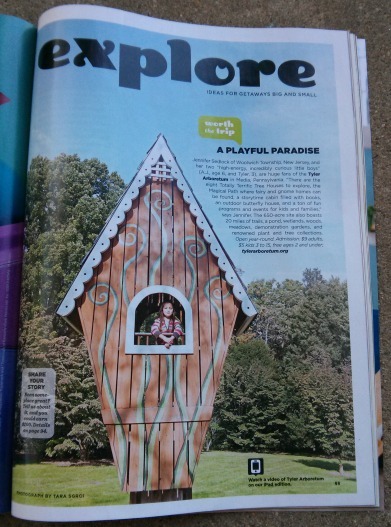 It's part of an exhibit called "Totally Terrific Tree Houses" at one of our favorite local places, Tyler Arboretum. The kids love running up the steps and peeking their heads out the window. Moms have to be fast with their camera because it's a great photo spot, but you have to be quick! If you've ever been to an arboretum, you know that these are great places for kids to run around, explore nature and play! Continue here to read my post: 5 Reasons Why We Love Our Local Arboretum and learn how to find arboretums across the United States.